Designed by Enrico Albertini, this wine bottle carrying bag is made from natural canvas and rolls up easily making it easy to store. Elegantly designed with beechwood handles, this wine bag is the perfect way to transport your wine anywhere you go. Store this wine carrier easily in your car and make sure you're never without a wine bag again! 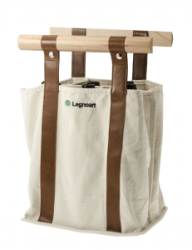 We love the quality of this bag - HOWEVER we don't love the large Legnoart logo on the canvas itself.